Over his decades long career Paul Schrader has continued to be a part of the film conversation, usually ruffling a few feathers along the way. Be it with creepy classics like Cat People and Taxi Driver or the debacle that was The Canyons, he continues to create content which gets people talking. His latest is no different. 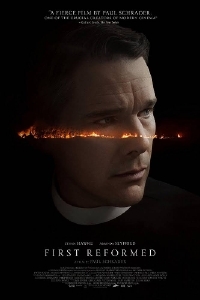 First Reformed stars Ethan Hawke as Reverend Toller, the pastor of a slowly-dying parish which now sees more tourists than members of the congregation. When one of his parishioners, played by Amanda Seyfried, asks him for council about her eccentric husband who she thinks is on the verge of committing a horrible crime, the pastor finds himself plunged into his own tormented past which appears to include more than a handful of sins. The trailer for Schrader's new movie is chalk full of audacious imagery and a tone of total desperation. This is exactly the kind of deep mediation which Schrader does so well and he seems to have found a great new muse in Hawke. First Reformed opens on May 18. A24 strikes again. This looks intriguing.